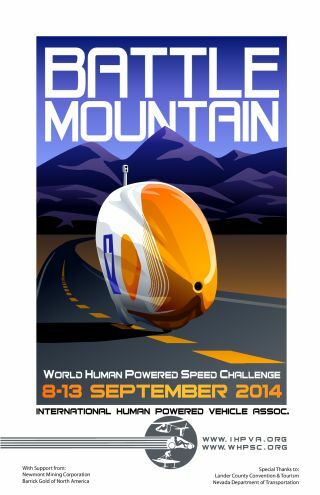 Join us for the World Human Powered Speed Championships! During the week of September 8th through September 13th 2014, cyclists from around the world will gather on SR305 outside of Battle Mountain, Nevada for the 15th consecutive year of racing on what is arguably the straightest, flattest, and smoothest road surface in the world. The 4,619ft (1,408m) altitude road allows riders an acceleration zone of 5 miles, enabling them to reach their maximum velocity before being timed over a 200 meter distance. The section of the road used for this event was repaved in 2009 with a smooth surface specially prepared for human powered racing by the Nevada Department of Transportation. The WHPSC is the setting for the record of "World's Fastest Human propelled by their own power", and all records set are sanctioned by the IHPVA. Do you want to race at Battle Mountain? Though runs on the SR 305 are prioritized for recognized speed champions, anybody with a fast bike can try out for the event. Battle Mountain Event Scheduling, Rules, and racing info - open to all! Spectators and especially volunteers are welcome to attend. Copyright 2000 - 2014 All rights reserved. Web design by Warren Beauchamp.